These plump little berries pack a serious nutritional punch. Just as importantly, they taste fantastic: bursting with sweetness, and just a slight tang. A hearty bowl of muesli, porridge or yoghurt and a heap of blueberries is sure to see you through the morning. Add to breakfast cereals, porridge, yogurt, milkshakes or smoothies. Use in pies, crumbles, cakes or muffins. Ripe blueberries are deep blue in colour with a whitish tinge (known as bloom) and should be firm. Store in the fridge and don’t wash until just before eating. Freeze on a tray – should last up to a year in the freezer. 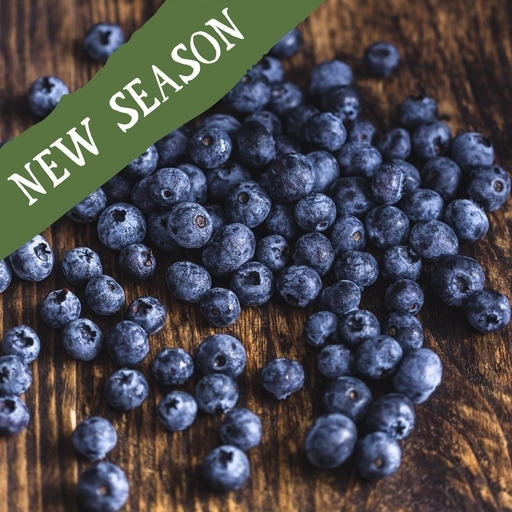 A native to North America, blueberries are less widely grown in Europe, however we import from Spain in late May, Chile, and sell homegrown UK berries in July, August and September.